It is difficult to fit in an elaborate gardening schedule in today's hectic lifestyle. How about some low maintenance, easy to care plants that will bloom all summer? Here is a list of seven great flowers that bloom from summer to fall. None of them requires too much care. Just prepare the soil in a sunny area and toss the seeds. The bright colors of the blooms are a delight to watch too. Daisy is a generic name given to all flowers having a central disc made up of numerous tiny fertile flowerets surrounded by delicate petals. All through the year some or the other variety of daisies are flowering. The snow-white petals of the Shasta daisy bloom from early summer until fall. 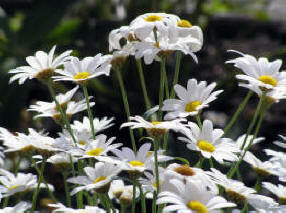 Shasta daisies need a well-drained soil and plenty of sun. Stake the taller plants. After the first frost, cut back the stems. These are easy to plant seeds that are great for beds and borders. As the seeds are tiny and easy to plant (just broadcast them over the prepared soil), they are excellent for wildflower meadows too. 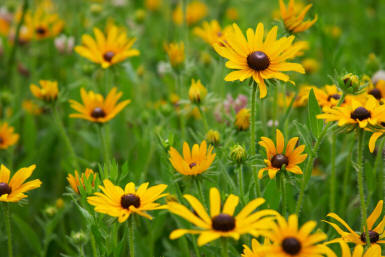 Black-Eyed Susan grows in all types of soil and prefers lots of sunlight. 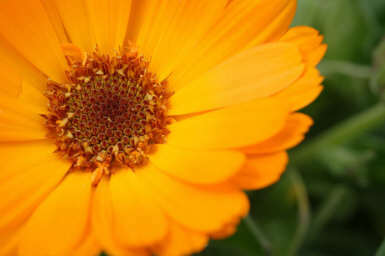 It is a large flower in shades of orange, yellow, apricot and cream. It is easy to grow from seed and is adaptable to all conditions except deep shade and extreme heat. This elegant perennial is a must in English Cottage gardens. It blooms from July to the start of winters. Dark green foliage mingles with spikes of spurred flowers in blue, red, white and yellow. They are also called Larkspur. Choose an area with light shade and well-drained soil to plant these stately blooms. Shield them from strong winds to keep the top-heavy variety from blowing over. Stake tall plants and deadhead after the first bloom. They are biennials or short-lived perennials in pink, red, purple, white and yellow. They bear spikes of tubular flowers that bloom in midsummer. 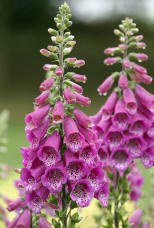 Foxgloves contain digitalis, a heart medicine. It is a low maintenance flower that multiplies readily. They are easy-to-grow perennials in shades of pink, blue, white and purple. There is a wide variety of geraniums available. Choose a site with moist soil and shade to prolong bloom. Propagation is by stem cutting that roots in about 6 weeks. There are about 200 species of these flowers. They have short stemmed, lance shaped leaves. The pea shaped flowers are arranged on a large spike. 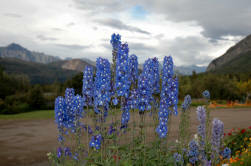 Lupines come in a variety of colors including bi colors. 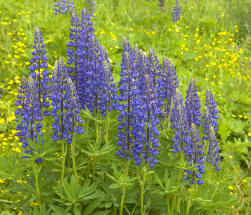 Grow lupines in a slightly acidic but well drained soil and keep it in a sunny site. Deadhead to prevent reseeding. So, plan your garden and see it bloom. When it is a mass of colorful blossoms, sit back and enjoy the view.